Need a summer salad fast? 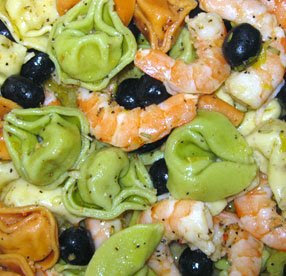 Shrimp tortellini salad is a fast, easy, and impressive crowd pleaser. Cook pasta (al dente) according to package. When ready pour into colander and rinse in cold water. Allow to strain in colander. Add shrimp to pasta in colander. While pasta and shrimp are cooling/straining dice pepper and tomatoes and slice olives. Add pasta and shrimp to bowl. Add all vegetables, sprinkle top of mixture lightly with garlic powder, toss to mix. Cover salad with grated cheese and toss to mix. Add enough salad dressing to make everything moist. Refrigerate 1 hour. Flavor will strengthen while refrigerating. This is one of the best recipes if you want to serve a large group. Looks impressive with the "shrimp" which are relatively cheap when buying the mini, pre-cooked salad shrimp and best of all it tastes great. I have added all kinds of summer veges to this one. The main thing is to keep all the veges rather small, as to not overpower the salad shrimp.